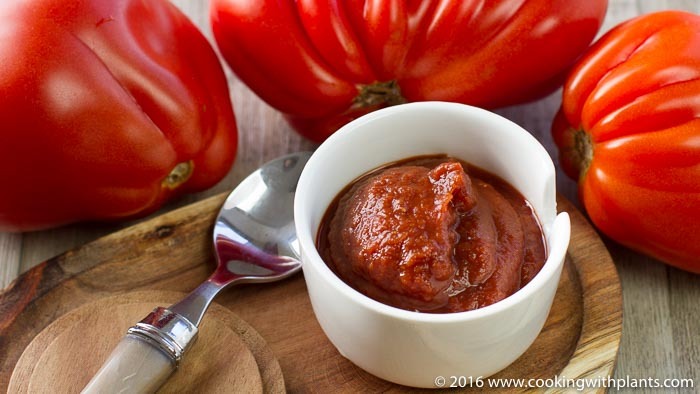 This vegan tomato ketchup is super easy to make and ready in just minutes. Just use your blender and have a tasty ketchup ready to go using just a few basic ingredients. This looks great! Do you know how long it would keep for in the fridge? It will keep in the fridge for about 5 to 7 days. Anja this is amazing! Ketchup in conventional stores usually have such long lists of ingredients… so this sounds wonderful. May I ask you how long it will last if I keep it in the fridge, in a container? Obviously there’s no nasty conservatives, but you think it can last up to 1 week? Thanks. It will keep in the fridge for about 5 to 7 days. Hi Anja, this tomato ketchup is going to be a smasher….How long does it keep? Thank you for all your beautiful recepies! This is a wonderfull idea! I will try it and I know now yet, that it will be very tasty and good! Hi Anja, How long do you think this will keep in the fridge? I have been making my own ketchup (which is cooked) for many years as shop bought is so laden with sugar so thanks again for sharing this recipe. About 5 to 7 days. Does the cumin/cinnamon stand out in the ketchup? Is it comparable to normal ketchup? Keep the awesome recipes coming!!! No it just all combined into a delicious ketchup flavor. How long will ketchup keep in the fridge? Can you freeze it in ice cube trays? About 5 days in the fridge to keep it fresh. I usually don’t like ketchup but since I made your no oil fries recipe I though it would be nice to try out your ketchup. I actually though it wouldn’t taste like real ketchup, but it does taste like THE BEST ketchup I ever had !! I’m so glad I found your channel!! Very nice. Is it possible to use fresh tomatoes or cooked ones instead of the tomato paste? “just” made this ketchup and I have never been a fan of store bought kind; this is amazing and delicious. for my own needs, i personally may try one less date and see if it works for me, too. kudos. thank you. Personally I’ve found that this keeps much longer than 5-7 days. 2-3 weeks minimum! And it tastes so much better than the store-bought kind. I made vegan burgers and frozen baked fries for some friends and put this ketchup on the side. Everyone wanted to know what kind of ketchup it was and where I got it! I make it in batches and keep it on hand. That’s fantastic! I’m so glad you love it as much as I do. As for shelf life, I always eat mine too quickly so maybe that’s why I put 5-7 days.